Four of us and a guide, another Abdou, leave Marrakech heading south. We cross a pass in the High Atlas Mountains different from where we’ve been before. The road has many switchbacks as it climbs higher and higher. The air is cold and the wind is very strong. It begins to snow. The next day, we learn that the pass has been closed to traffic due to heavy snowfall. The landscape south of the mountains is scorched, the color of copper. We visit locations where the movies Lawrence of Arabia and Gladiator, among others, were filmed. There are occasional oases that are filled with trees—date palm, olive, walnut, plum, fig, apricot, apple, pomegranate. We take a hike through one of them near the village of Skoura. The fruit trees are starting to flower, others just leafing out. The green is deep and bold, such a contrast to the red earth. 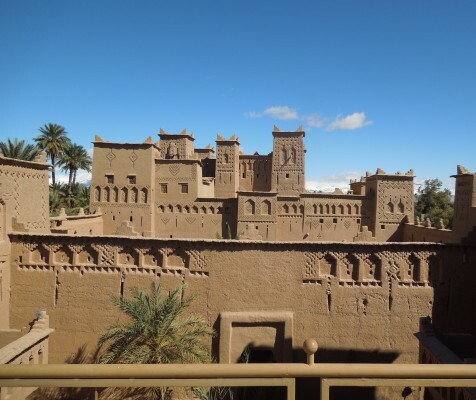 We drive through the Anti Atlas Mountains to the Draa Valley further south and walk through an even larger oasis where the vegetation is lusher due to the warmer climate. We tour kasbahs where pashas of old lived in luxury, having accumulated wealth and power. Some have been converted to hotels and are lovely. And then into the Sahara, dusty and windblown. We drive through a village, isolated and remote. The school children run to our vehicle waving and shouting, perhaps the high point of their day. We walk into a fierce wind, stop for tea in another small village where the women come out and display their handmade colorful scarves, little camel figurines, and jewelry. All of us buy several scarves to wrap around our heads and faces against the sand. We arrive at our camp for the night, a spectacularly beautiful place, tents all set up, and watch the sunset in a marvelous sky so full of clouds, so free of any impurities. A magical day. 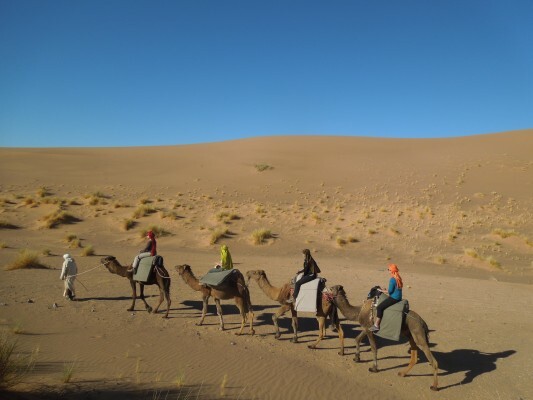 We ride camels for seven and a half hours deeper into the Sahara, first heading south toward the Algerian border then east. I alternate one hour on the camel with one hour of walking to avoid the mishap I had the last time I rode a camel for two hours straight: a saddle sore that lingered for ten days! The heat is intense, the land parched; dunes butternut squash orange; hillocks with tufted grass, the color of straw mixed with green; thorn acacia trees, scrubby for lack of rain. There are no villages here. We reach our second camp and later see a glorious night sky filled with countless stars, there being no light sources to diminish their brilliance. 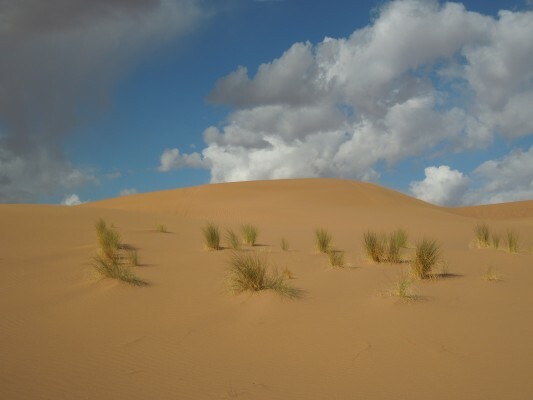 We spend five days in the desert riding camels and walking (mostly the latter for me), hiking the largest ergs (sand dunes), and camping four nights, each night at a different scenic location. Juliet and I regret saying goodbye to our camels, Mr. Camel and Bernie, respectively (the names we gave them, of course! 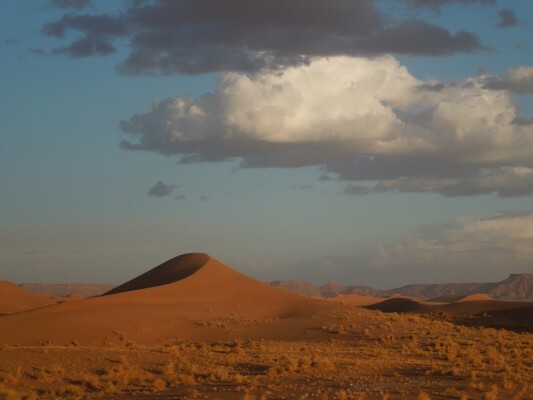 ), and ending our journey in the Sahara.